Here at Safepoint, we think that nothing is more important than worker safety. That's why, if we're not focused on building and improving our Lone Worker Solution, we're keeping up to date on the much maligned world of health and safety. In fact, with so much health and safety data passing through the Safepoint office, we thought we'd take some time to share the most vital and interesting safety facts you need to know right now. That's right, in 2016/2017 a truly staggering 5.5 million days of work were lost in the UK due to work-related injury. This ever-present threat to workers' wellbeing (and to productivity) is too huge to be ignored. Plus, imagine trying to catch up on your emails after 15,000 years of sick leave. (And yes, we did the maths). 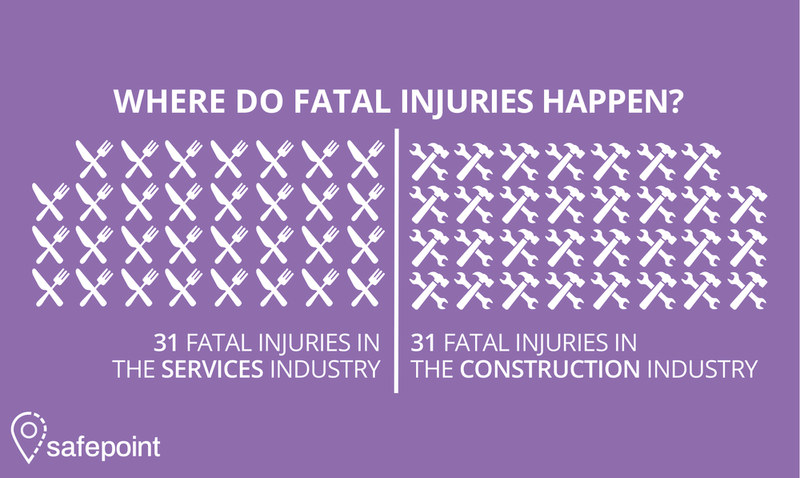 #2 There are as many Fatal injuries in the services as there are in construction. Sadly, fatal injuries can happen in any industry. At Safepoint, we have noticed that a lot of time is focused, quite rightly, on the dangers of manual labour, but without taking time to admit the threats posed in other industries. Below you can see that fatal injuries can happen in any industry. That's why a robust health and safety strategy is important for all business types. (statistics taken from 2017/2018) Sourced here. Work-related injuries cost a staggering amount to British industries every year. So staggering, in fact, that we couldn't picture it without using jumbo jets. Bonus fact: 50 jumbo jets could carry roughly 15,000 passengers. Around 22% of the British workforce are considered lone workers. A lone worker might be anyone who works on their own without direct supervision – including construction workers, health workers and carers, sales workers and more. The legal definition of lone workers also includes many contractors and part time workers. Plus, with the rising freelance and ‘gig’ economy, there are many reasons for this category to be growing. For more information on who may count as a ‘lone worker’ see our helpful definition, here. Roughly 1 in 50 of Britain's 31 million workers may suffer injuries this year. This is a worrying prospect even in a traditional work place, with high supervision and easy access to emergency help. When you consider that lone workers can often work in hard to reach areas, perhaps miles from their nearest coworker, the threat becomes even higher. That's why Safepoint is proud to be working with lone workers and industries of all types to build solutions that will help keep lone workers safe. Health and Safety regulations can be a little daunting and, sometimes, a little dull... However, knowing the scale and complexity of workplace dangers can be hugely beneficial. So if you found this blog valuable, leave us a comment and tell us what you'd like to see next. You can also sign up to our newsletter for all the latest on health and safety news and updates on our Lone Worker Safety Solution. How safe is the health and social care sector?